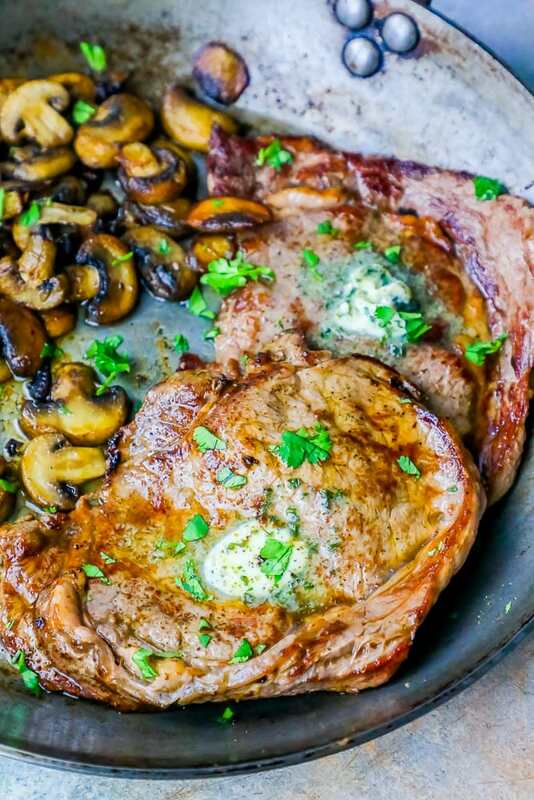 The Best Oven Broiled Ribeye Steaks with Mushrooms Recipe is a delicious complete one pot steakhouse dinner with perfectly broiled ribeye steaks and meaty broiled mushrooms topped in a garlic herb butter that will impress even the pickiest eaters. 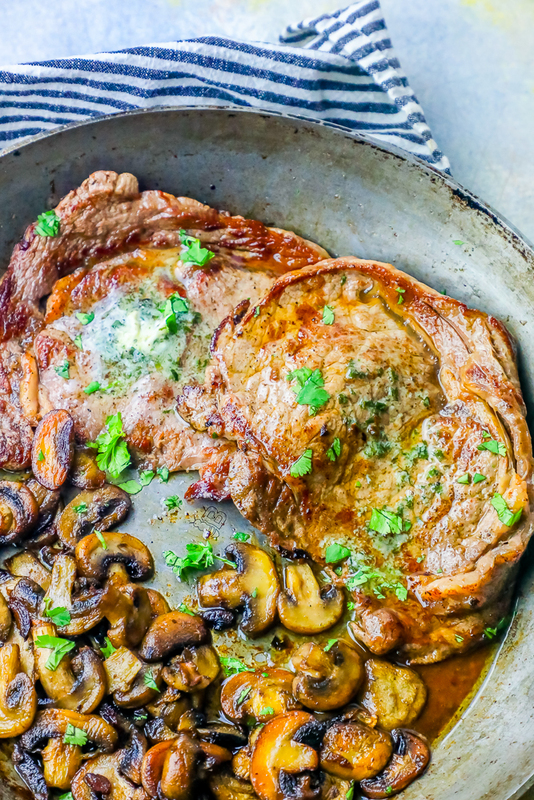 Learn how to cook steak in the oven with mushrooms for the best broiled steak recipe ever. 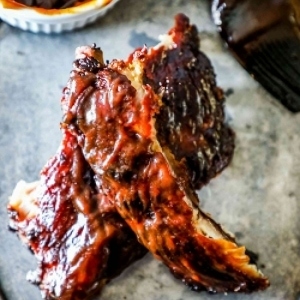 Cooking a steak at home often means firing up the grill – but it doesn’t have to! 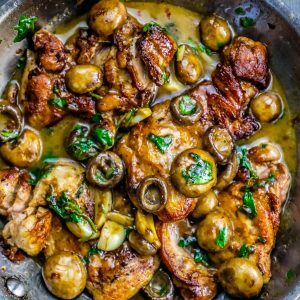 To get a delicious steakhouse style steak, you can use your stovetop and your broiler for a perfectly caramelized steak that tastes like it came from your favorite swanky steak joint – and we’re even cooking perfect meaty mushrooms for a knockout side dish – right in the same pan for a truly one-pot steak and mushroom dinner that everyone will love! Since home kitchen ovens don’t reach the ultra-high heat needed for restaurant quality steak, we’re using the broiler on high and quickly pre-searing our steaks, as well as a secret trick to get the perfect oven baked steaks that taste like they came from a steakhouse – right from your own kitchen. While pan-searing steak tastes great, it can create a ton of smoke and grease – so we’re getting a pan-seared steak effect right in our oven with this perfect oven baked steaks technique. This method does require specific techniques, and a good amount of ventilation, so be sure to read the tips and tricks I am including below. Important note: This recipe is formulated to make 2 ribeye steaks and mushrooms. If you want to make more than 2 ribeyes using this method, use two pans, or cook the steaks in batches. 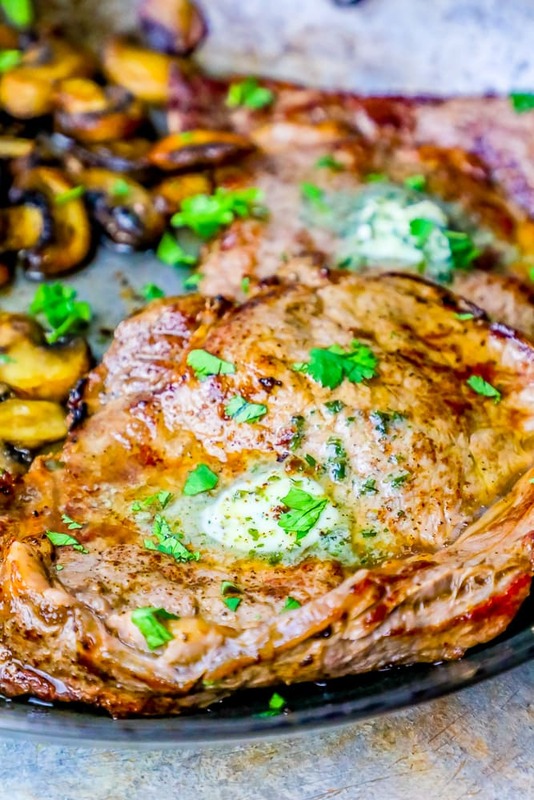 JUST TAKE ME TO THE BEST BROILED RIBEYE STEAKS WITH MUSHROOMS RECIPE ALREADY! 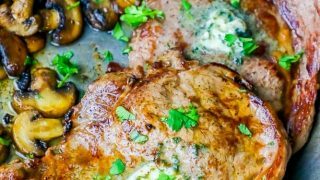 If you’d rather skip my (very helpful, i think) tips and tricks, essential cooking info, and similar recipe ideas – and get straight to this deliciously easy broiled ribeye steaks and mushrooms recipe – simply scroll to the bottom of the page where you can find the printable recipe card. To cook ribeye steaks in the oven, you will need a couple of critical tools – but if you enjoy cooking at home, you probably already have a lot of these anyways. While we are using specific pans, you’re likely to already have a heavy cast iron pan. 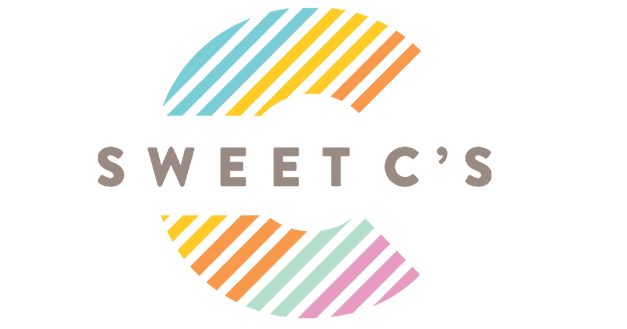 If not, click my links to visit my Amazon affiliate suggestions – which give me a small commission that helps to offset the costs of running Sweet C’s and giving you totally free recipes! Ribeye steaks are one of my favorite steaks for their rich, delicious flavor that comes from having lots of fat marbled throughout. Ribeyes are best when cooked very, very hot – and very, very fast – making them a natural fit for the grill. It’s not always ideal to cook a steak on the grill though, so this technique will get perfect steak right from your oven, using your broiler for super high heat! The key to a perfect ribeye steak at home in your oven is cooking it with the highest heat possible – and as fast as possible. To do this easily, preheating your oven and your pan is essential. Your pan should be so hot when you put the steak in it, it sears like it would on a stovetop. 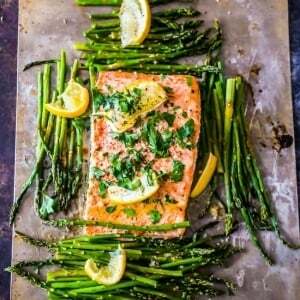 To do this, it should sit in a preheated oven for about 30 minutes. When you go to cook your steaks, use extreme caution with the very hot pan – I often forget and try to grab a pan in the oven by the handle, which would cause major injury! Be sure to keep a high heat oven mitt nearby so you don’t forget. Ribeye Steak needs to cook quickly for the best flavor and texture – and it helps to prepare your steak to cook perfectly. Don’t skip the following tips for perfect ribeye steak in the oven every single time. Let ribeye come to room temperature for at least 30 minutes before cooking. Cold ribeye steak won’t caramelize and sear properly, room-temperature steak will have the most juicy, melt-in-your-mouth flavor and perfectly seared crust! Pat steak dry with paper towel if there is any moisture from packaging. Moisture leftover from packaging is common unless you bought dry-aged steaks – be sure to pat steaks dry to get a perfectly seared crust so your steaks sear, not boil. Salt and pepper steak generously before cooking. Preheat pan in oven for at least 30 minutes to get a sautéed steak effect. I can’t undersell the importance of heating your pan to be scaldingly hot before placing steaks in the pan – let it sit in the oven after it has come to 500 degrees for at least 30 minutes before cooking. Once your steaks, pan, and oven are prepared – it’s time to broil your steak to perfection! These tips will help you get perfect oven broiled steaks every time – from ribeye to new york strip! 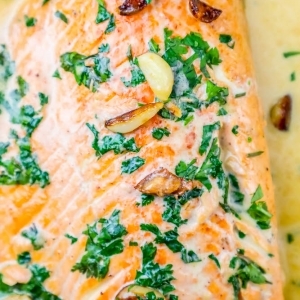 Use a little oil or butter. To keep the steak from sticking, swirl a bit of oil through the pan. 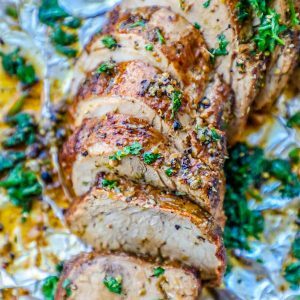 Be sure to use a high-heat oil that won’t smoke in the pan – peanut or canola oils are great choices, but you can also use lard, tallow, or clarified butter/ghee. Don’t flip your steak until it has developed a lovely crunchy brown crust – flipping too often will cause your steak to boil instead of sear! Steaks are best when cooked at very high heat, very quickly – so the pan shouldn’t be too crowded or they will release too much liquid, again, causing the steaks to boil instead of searing. Keep the oven door closed so the heat can stay very, very high. Letting heat escape will make the steaks cook slowly – causing a tougher, rubbery texture. You want heat as high as possible. 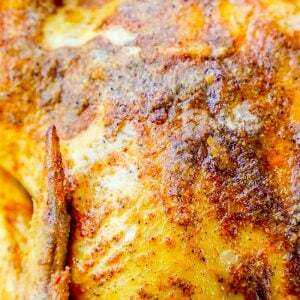 This cooking method will provide a lot of smoke, so be sure to ventilate well. Use Caution with Hot Pan. This method uses a very, very, very hot pan to cook the steaks quickly – so extreme caution must be used! When adding oil to pan, steaks to oil, or touching pan at all, remember the pan will be extremely hot. Wear high-heat oven mitts to keep your hands safe. 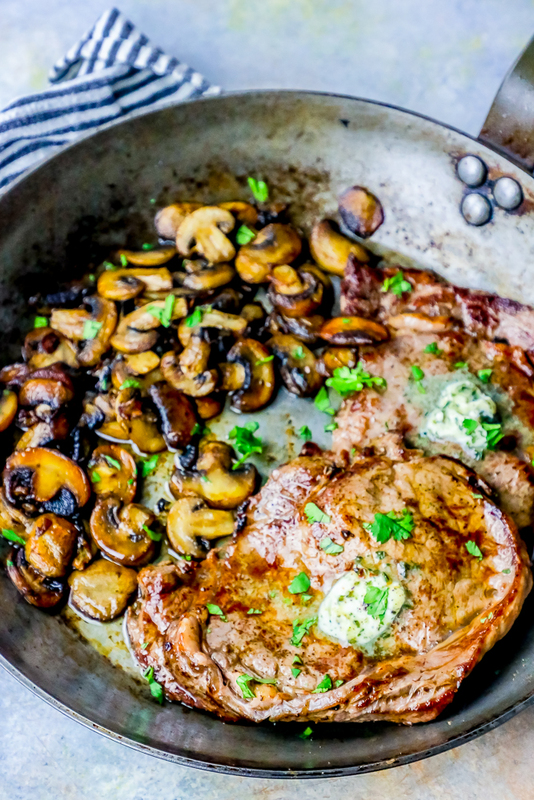 If you love this hearty and delicious steakhouse style broiled ribeye and mushrooms dinner (that is also keto diet approved and naturally low carb), you’re also going to love some of my other favorite low carb dinners! 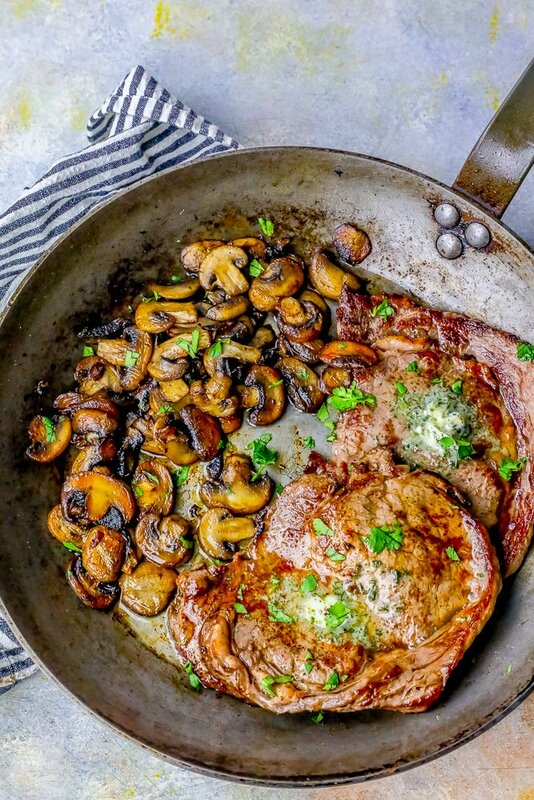 If you love this Oven Broiled Ribeye Steaks and Mushrooms One Pot Recipe as much as I do, please write a five star review, and be sure to help me share on facebook and pinterest! Preheat broiler to 500 degrees. Add heavy cast iron pan to oven to preheat. Remove steak from packaging and pat dry. Generously season steak with salt and pepper and let come to room temperature, about a half an hour. Prepare mushrooms right before cooking the steak - wipe clean with a paper towel, remove stems if desired, and then slice thinly. When cast iron pan is scorching hot, using potholders, add oil to pan and give a quick swish around the pan. Carefully add steaks to pan, then mushrooms, and close oven. After 4 minutes, flip steaks and stir mushrooms. Add garlic and thyme to pan. After another 4 minutes, check steaks for doneness. Keep flipping and stirring steaks and mushrooms until steaks are at your preferred doneness, depending on the thickness of your ribeye steaks. Just before removing from oven, add pats of garlic her butter to the top of the steaks. Remove and let rest for at least 10 minutes before serving to lock in the steaks juices. I read your recipe for ribeye steaks and I’m gonna be doing as you said. However, I do have 1 issue with your recipe. When speaking of adding oil to the pan, you suggested peanut or canola. Peanut is fine, however canola oil is NOT a cooking oil. If heated the chemical structure of the canola oil changes into a compound equal to liquid plastic!! Please, please, dont ever suggest canola oil to ever be used to cook. Its more for salad dressings, etc. You have people who follow your advice, your site can be a powerful tool, please be wise and careful with it. Please don’t have people eating liquid plastic! If your unsure whether this is true, please look it up. Thank you for your great recipes and the time you take to post em! Thank you for every single detail here ! Girl, I’ve learned my lesson. I’m never visiting your site unless I have the ingredients on hand to make your ridiculously delicious recipe! !